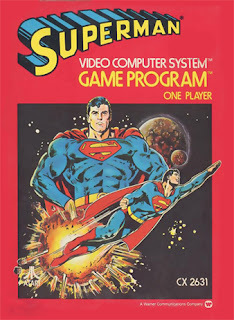 As near as I can tell, the first video game/comic book crossover was the Superman game that Atari put out in 1979. Despite utilizing some fantastic cover art on the box, the game itself sported no such detailed art. Superman was essentially a blue stick figure with a red wavy line representing his cape. But that was video game technology in the late 1970s. My understanding was that the game used the same basic engine as Adventure, which depicted the protagonist literally as a yellow square. I seem to recall reading a review of a later Superman video game that posed the question: how do you even attempt to portray all of Superman's powers in a video game? Their answer was that you don't; you provide the character with a decidedly more limited amount of powers available to the user to keep the game controllable. I think they got that idea from Atari. Due to limitations of the game system itself, the Superman of this game could only fly and use super-vision to see over to the next screen. (It was called x-ray vision in the game instructions, but that never made sense since the character wasn't actually seeing through anything.) Ostensibly, Superman also had super-strength in this game as well, but that was more a function of simply making all of the dozen or so items carry-able regardless of what their size/weight might've been. It was one of the earlier home console games with an actual plot. At the start of the game, Lex Luthor blows up a bridge, and the player has to fly around to capture Luthor and his henchmen (the number of henchmen varied depending on the difficulty level setting) and then collect the three bridge pieces and return them to their original location. (The game automatically had the bridge repair itself when you brought all three pieces together.) To make things additionally challenging, there were several Kryptonite satellites floating throughout the city that would depower Superman if you touched them and he had to find and kiss Lois Lane to have his powers restored. The game mechanics were pretty straight-forward, as pretty much all video games were at the time. Also, like all those early games, there was no soundtrack -- the only sounds were the ones that came from an action. An audible explosion when the bridge blows up, a vaguely morse-code-ish ticking from the satellites moving, a special ping when you kiss Lois... Most of these worked well enough, but flying was represented by a kind of whirring noise whenever you were in flight. And, as you spent the vast majority of the game flying, the soundtrack of the game wound up being that whirring. Kind of a static-y white noise that would drive you nuts after more than a few minutes. What's interesting about the game is mostly that it exists. My understanding is that Atari programmers were more interested in developing interesting and engaging games, trying to push the boundaries of what was possible in that console. But the corporate folks felt that Atari needed some name recognition and licensing to get players to pick up the games, so it was the marketing team who sought the license from DC and had programmer John Dunn (yes, this game was written and coded entirely by one guy) try to depict the man of steel in man of steel sized pixels. The game was both a critical and commercial success, and probably did more than a little to help blur the line between gamers and comics fans.